Last week I went on a little escapade to London and the new area around King’s Cross to visit the House of Illustration, which as you might have guessed, is a gallery dedicated to illustration, and is therefore right up my street. I had gone to see their Comix Creatrix exhibition and generally to have a nose around, as it was my first visit to the place. The exhibition – celebrating 100 women who make comics – was a real treat with original artwork making up the bulk of the displays including pencil roughs by Tove Jansson (the Moomin creator) and Audrey Niffenegger (the Night Bookmobile), as well as finished books. I spent hours soaking it all up. Then just to top it off, I bumped into an old friend as I was leaving, before swinging by the V&A to meet my mother for a cup of tea and some excellent cake in the Poynter Room and a quick swoon over their stained-glass exhibition before heading home. So all in all, an excellent day out. And now, as promised, it’s time for another of my moth illustrations. 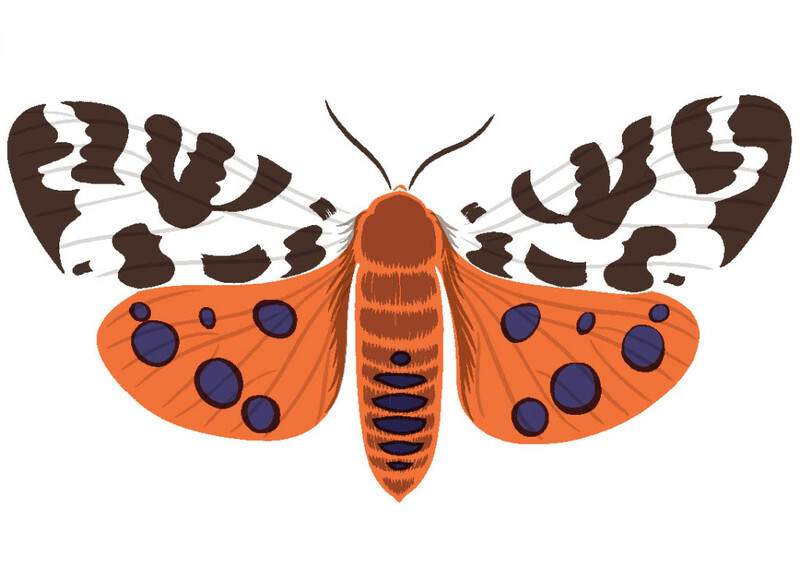 This one’s a Garden Tiger moth. I’ve now finished all five of these which will become the first range of prints to be sold in my future etsy shop. I’ll be posting the full line-up on my website soon. Next up will be a series on British birds.